The Madone is Trek's ultimate racing bike, outright speed, aerodynamics and efficiency, the Madone spares no expense in bringing you a bike all about winning. The SLR 9 provides the latest in electronic shifting thanks to Shimano's Dura-Ace Di2 components which blend together weight, performance and reliability for the best possible ride. The Madone is also compatible with aero bars so it can also be used for all your TT and triathlon events. 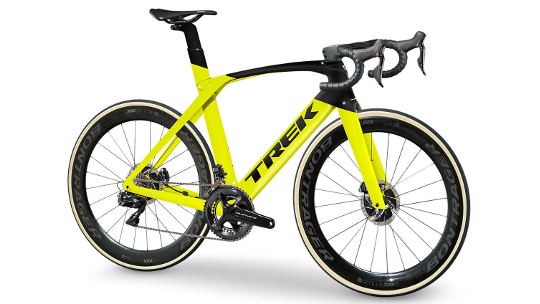 The Madone features futuristic adjustable IsoSpeed technology, allowing you to change the level of comfort depending on your terrain, in its lowest setting 17% more compliant than the standard Madone. Finally, the Madone features an integrated bar and stem that is fully adjustable, allowing you to get your fit just right. The best. El mejor. Le meilleur. However you say it, this is it. 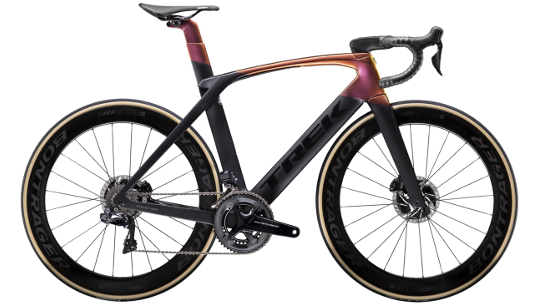 Madone SLR 9 Disc has the triple threat of aerodynamics, lightweight and ride-quality – all finished with parts that are simply... well, the best.